Aer Lingus flights will not be grounded if Britain exits the EU on 29 March without an agreement, the airline's new chief executive has said. "We've reviewed the legislation in relation to any scenario," said Sean Doyle, who took over piloting the company in the past few weeks. "We are very confident we will continue to operate. Air travel is fundamental, it is very important, and I think legislators and the various bodies recognise that. "And we have plans, and we are very confident we will operate," Mr Doyle added. He also said he was "absolutely confident" that Aer Lingus' parent IAG would be able to convince the European Commission that it will remain majority owned in the EU post-Brexit. Under current rules, in order to maintain open access to European skies, airlines must have a majority of their shareholders based in the bloc. The European Commission has reportedly expressed doubt about whether IAG, which also owns British Airways and Iberia, will continue to satisfy that requirement after Brexit. Aer Lingus today unveiled its new brand livery, more than two decades since the airline's last refresh. 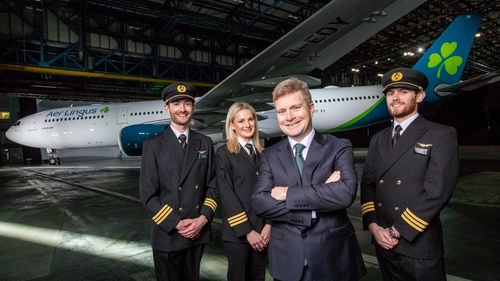 In relation to the company's new aircraft livery, Mr Doyle said it is 22 years since it had undergone a brand refresh and it felt now was the right time. "Aer Lingus is a modern Irish success story," he said. "We are expanding, we are performing very well and there's a lot of great opportunities we want to develop. And having a fresh modern twist on what is a great brand is something we wanted to develop. "So we have been working on this for the bones of a year. We are delighted with the outcome. We think it retains a very, very strong Irish heritage but also looks to the future in a contemporary way." Asked whether passengers really care about branding, Mr Doyle said it is part of the wider experience. "I think the Aer Lingus brand is loved, I think it creates a very strong bond with our guests." He said the cost of the rebranding exercise was lower than the €2 million reported by some media. Mr Doyle said the company plans to grow its transatlantic fleet from 17 to 30 in the coming years and that would mean deepening the quality of the schedule to places it flies and adding new destinations to the map. In relation to suggestions of a partnership between Ryanair and Aer Lingus, which would see the low-cost airline feed passengers into Aer Lingus' transatlantic routes, Mr Doyle said it is something that is under evaluation. But he said other issues, like the brand relaunch, were the current focus of the airline and the Ryanair issue is one of a number in the pipeline. Regarding possible industrial relations issue at Aer Lingus, Mr Doyle said the airline had delivered real business transformation in recent years in a collective way with all of its workforce. "I expect that to carry on in the future," he said. "We are always having conversations about ways we can be better, be more productive, be more competitive, and we are honest with ourselves and our employees about that and that will continue. But I expect that to continue in a constructive and engaging way."